Our family has some amazing friends. And when my big boys end up staying over at someone else's house for a couple days, yet still doing dishes, sorting laundry, entertaining younger kids, shoveling snow... I love that. I hate not knowing. That applies to a whole lot of stuff in my life recently. I had an amazing morning yesterday. I slept in (which is great too, but not the point here). 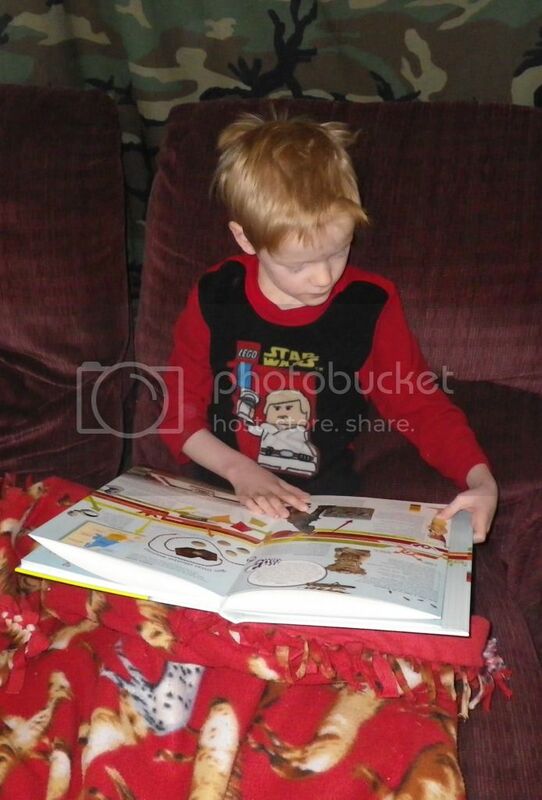 When I got up, Thomas, my 11 year old struggling reader, he was... you ready for this? 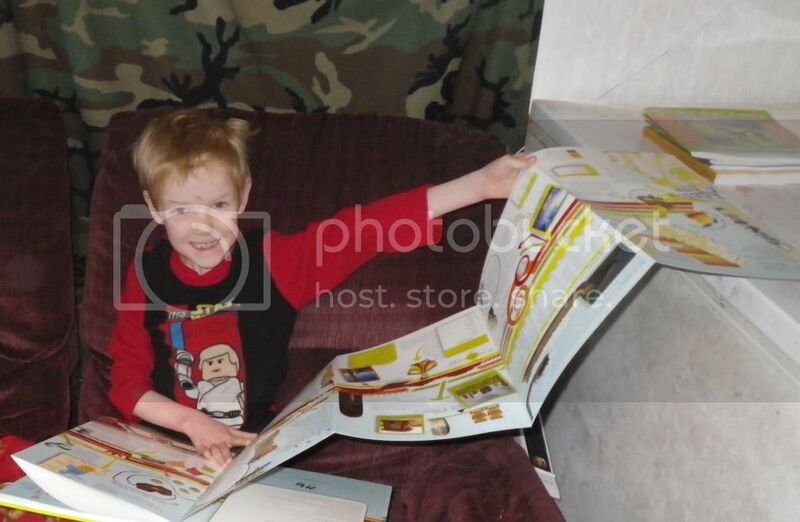 He was sitting on the couch with his nose in a book. A real book. He was reading it. And laughing. And then giving me little tidbits about it. Thank you Read Live. 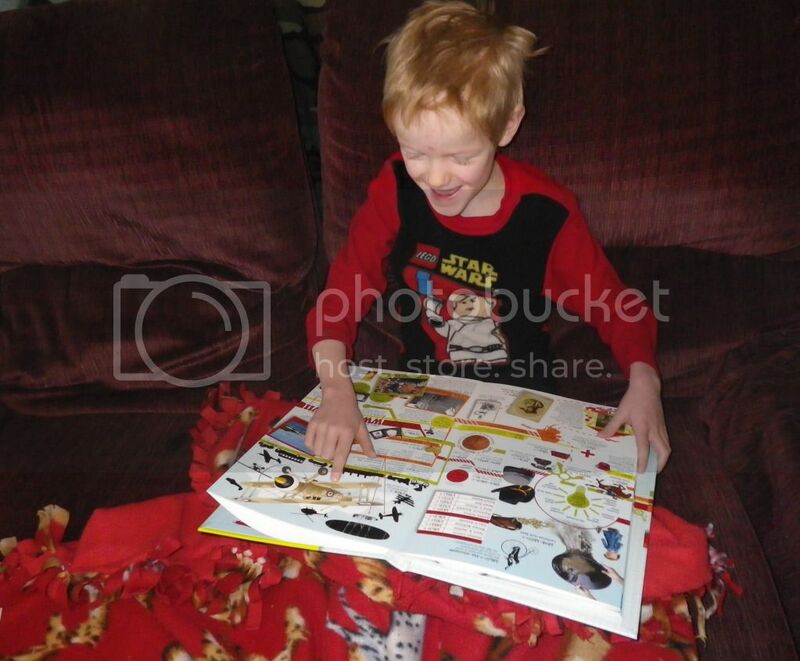 We had a fantastic review-product filled Christmas. With very cool products. I love being a reviewer. I don't particularly like power outages. About 8 hours without power at the house today. Frustrating. But hey, it was a good day for it... fairly warm, and the power at the well stayed on so we did have water. And that is as much as I can handle writing tonight. It's time for another Reading Aloud Challenge... and I'm reporting in that, um, I'm pretty sure I didn't read anything aloud all week. I have absolutely nothing to report. Okay, well, I did spend about 10 minutes reading about Protists with Thomas. But I think that was it. Not sure there will be much to report next week either, but I'll post anyway. So... if you do have a report, I'd love to read about it. And if not, I'd love a comment telling me I'm not alone. It's been fun doing this. Posting these every week (except Thanksgiving) has definitely made me more intentional about actually following through on my intentions. And my plan is to continue in 2012, posting the reality here... even weeks like this where I post that I did nothing. Every so often, I end up with the chance to review a product that is so incredibly cool I don't know how we managed without it. 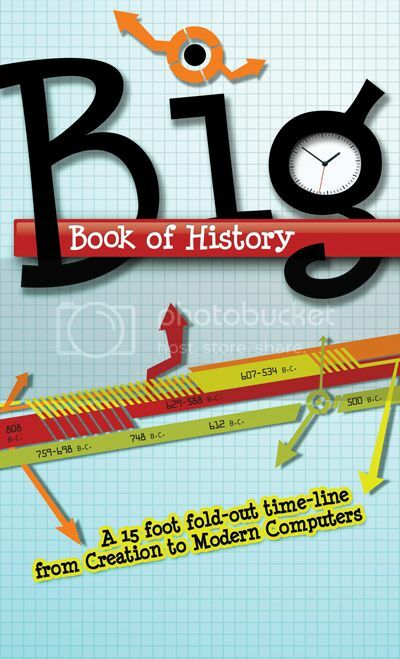 Today, I'm telling you about one of those: Big Book of History. The timeline is fun... lots of pictures (photos and illustrations) and little text boxes, charts, graphs, etc. Orange is for world events... all that stuff you expect to see on pretty much any standard timeline. For instance, to choose a page towards the end, the 1852-1943 page talks about the Pony Express, the purchase of Alaska, P.T. Barnum, Buffalo Bill, the first modern Olympics, the eruption of Krakatoa, the San Francisco earthquake, prohibition, the death of Ernest Shackleton, Charles Lindberg, the great depressions, the dust bowl, Amelia Earhart, and the holocaust. Lots of different stuff. Red is for civilizations and empires. Also pretty standard stuff, like the American Civil War and the end of slavery, the 1st Sino-Japanese War, the Spanish American War, the first Pulitzer Prize, the assassination of Archduke Ferdinand, WWI, the Russian Revolution, the League of Nations, Civil War in China, WWII, and the United Nations. Green is for inventions and technology. My boys love this line. You get to see things such as a whole spread on Edison, the telephone, dynamite, basketball, the first movies, penicillin, the first television station, tv dinners, Hoover Dam... and a whole separate transportation timeline with the first mass produced auto, the first flight, the first helicopter flight, the Titanic, the Hindenburg, the first jet, and the death of Nikola Tesla. And Yellow is for Bible and Christian history. For this same page, that includes things like the start of the Salvation Army and Red Cross, Billy Sunday and the Scopes Trial. Most of the above stuff is mentioned only briefly... but there is additional information on some things too. For the most part, this can serve as a supplement to *any* history you are doing. Here you can see Richard looking through it like a book. 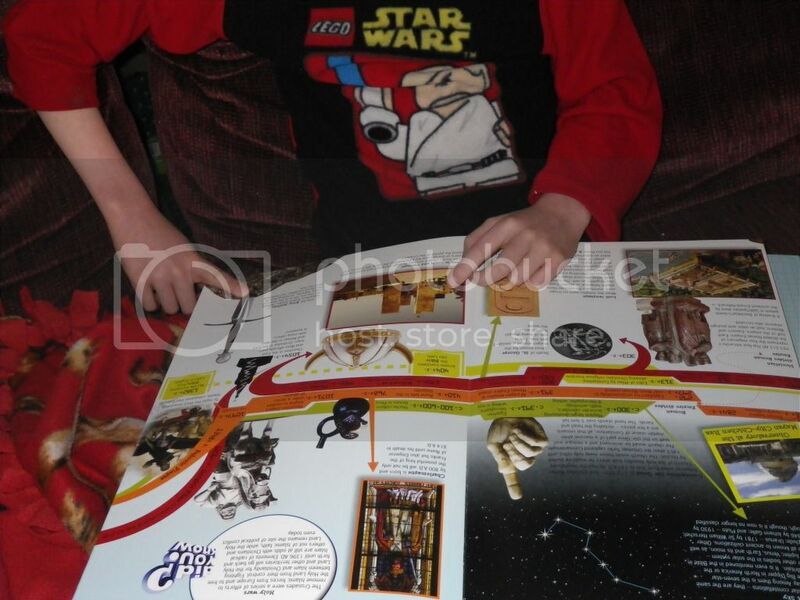 Notice the timeline part running through the middle of the pages, and all the colorful stuff around it. And that still isn't all of it. But I don't have a good picture of it all stretched out. For the homeschooler (or teacher) there is also a guide available, either in print, or as a free download, that really fleshes this out into more of a stand-alone history resource. Amazing book. Well worth the read. Not for anyone below high school. William & Thomas -- yeah. We didn't even read a single chapter of God King. Richard & Trina -- I opened Mountain Born. Once. Didn't read a single word. But I opened it. Our one semi-success? Unveiling the Kings of Israel. I reviewed it. The book is fabulous. We do still have to finish it up, but have gotten through most of it. (I don't necessarily finish non-fiction titles before I review them... just fyi. I read a good chunk, and I'll flip through/skim the rest, then review it.) This one will probably (at the rate we're going lately) be on my Reading Aloud post for the next couple weeks. In normal times, we'd be finished. Plans for this coming week? You know the drill. Finish some of what I just listed. I don't think I'm going to worry about starting something new with Connor until January. How did your week go? 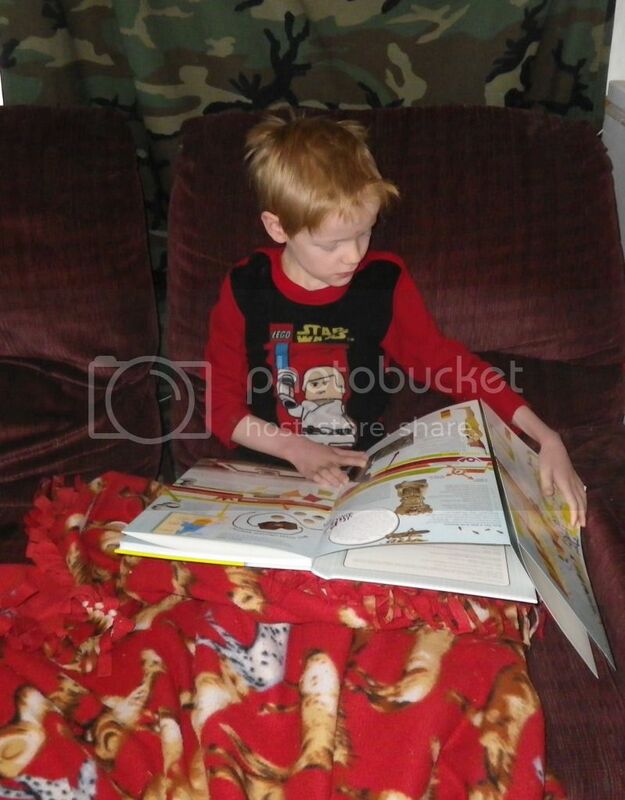 Do you find you are too busy at this time of year for reading aloud, or is it just me? Because of Sonlight Curriculum, I have read a lot of missionary biographies. I'm always inspired by some of the "greats" -- you know, the ones thanking God for the wonderful meal they are about to eat even when there is no food in the house, where right as this faith-filled person says, "Amen" there is a knock at the door and food arrives in some miraculous fashion. I want to be like that. But my favorites are the people who seem more real -- more like me. The ones who struggle with their faith even as they are out in the mission field. Because "struggle" and "doubt" are where I live. One minute, I'm pretty sure that I'm doing what God would have me do at this time... the next minute, I'm questioning my purpose. The next, I'm seeing God's clear answer to prayer in a bag of cheddar cheese. The next, I'm questioning how I can ever be sure that I believe what I believe. Audra Grace Shelby and her family served in Yemen... and she is as real as they come. Aside from her name, which was changed to protect the people she knew in Yemen and the missionaries still serving there. In Behind the Veils of Yemen, she shares her spiritual highs and lows. She shares the lessons she learned, and the answers to her prayers. She shares her doubts and her fears. And she shares the lives she glimpsed in Yemen. With only prayer and a faith that always seemed too small, Audra Grace Shelby departed with her family on a one-way flight deep into the heart of conservative Islam. Here she recounts her harrowing journey as a Christian woman thrust into a culture dangerously different from her own. From the friendships she forged, to her gnawing doubt and fear, to her offers of hope when her friends' religion failed them, she gives us glimpses into a world most have never seen. And she shows how the grace of God transforms lives--even in the midst of an Islamic stronghold. It's time for another Reading Aloud Challenge... and I just keep thinking this post ought to be incredibly easy to write. Just copy and paste last week. Connor & I read a couple chapters of Peace Child. So we are down to something like four chapters. We love it, I don't know why we can't get through it. Well, partially because even though it isn't nearly as gruesome past the first few chapters, I still don't want to read about cannibalism to this extent in front of Richard and Trina. Richard & Trina -- okay, so I managed another chapter of Mountain Born. One. Our one semi-success? Unveiling the Kings of Israel. I may get this reviewed tomorrow. I hope so. The book is fabulous. Our Christmas read-aloud, The Story of the Other Wise Man by Henry Van Dyke. Never even opened it. In more positive news, William started reading a King Arthur book aloud to Richard and Trina. And he's reading a chapter a day aloud to me from the Bible. Plans for this coming week? You know the drill. Finish some of what I just listed. Finish at least ONE of what I just listed. <sigh> Since I failed at that last week. How did your week go? Hopefully better than mine... or hopefully you have some good excuses for why it was slim pickin's. I don't. I've said it before, but I am totally loving the TOS Homeschool Crew this year. I have the chance to review so many incredibly cool products. And this one is totally fun. The World's Greatest Stories sent us the first volume in their CD series: The Prophets. On it, George W. Sarris tells the stories of the book of Daniel (The Blazing Furnace, The Handwriting on the Wall, and Daniel in the Lion's Den), one of Elijah (Elijah & the Prophets of Baal), plus the book of Jonah. Sarris brings the characters alive... in The Handwriting on the Wall, for instance, it opens with Belshazzar at his dinner party... slurring his words and sounding like he's had a bit too much to drink. Or in the story of Jonah, you can hear the quaver in the voices... the fear comes through loud and strong. But what do the kids think? They love them. The older ones have all commented on how this isn't just another Bible story... "That guy really makes you feel like you are right in the middle of an action-adventure movie. Well, except it is pretty short to be a movie." (That quote was actually split between two kids, and I forgot which two.) They would love to have more. At only $7.95 these would be a great extra gift, and if you order today, you might have these in time for Christmas... this is exactly the kind of thing I love to put in Christmas stockings. Santa, in my house, always brings some very, very Christ-centered gifts. There are six volumes at the present. The Life of Christ, Beginnings, Joshua & Esther, Joseph & His Brothers, and Defeating Giants are the other ones. There is also a longer one... The Real Story of Easter, which is only available in NIV. 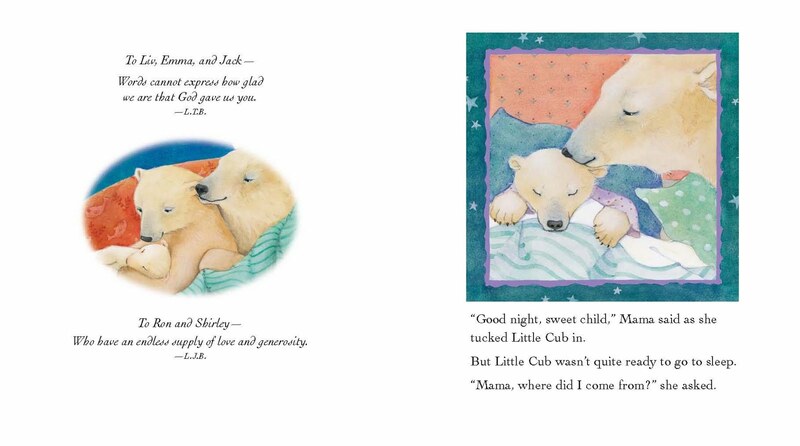 These are intended for anyone age 4 and up, but the FAQ page said it best: "adult stories that children love to listen to". I highly recommend these. If you go to the product page, you can listen to a short clip from each (in both versions) but I don't think the clips do the product justice. Disclaimer: As part of the TOS Homeschool Review Crew, I did receive this game for the purpose of a review. All opinions are my own. For more about my take on reviews, visit my blog post here. When I was probably around 10 or 11, I started playing Rummy (and later Gin Rummy) with my grandma. Well, Grandma and whoever else we could rope into playing with us. I loved the game. Some luck, some strategy, some making inferences based on what other people are discarding... and attention to detail. When she thought you understood the game, we'd start keeping our hands to ourselves... and it would be a long time before any of us kids won again. I had forgotten how much I enjoyed the game... until recently, when I've been playing a game from I See Cards with my bigger boys. Fractazmic. One version is a lot like Rummy, only it is easier. And harder too. I better explain, huh? Fractazmic consists of a deck of 60 cards, split into 3 suits: tenths, twelfths and sixteenths, with each suit being a different color. The tenth suit includes cards that have fractions that can be converted to tenths... either tenths, fifths or one-half. The twelfth suit can be converted to twelfths, and it includes twelfths, sixths, fourths, thirds and one-half. The sixteenth, similarly, consists of sixteenths, eighths, fourths and one-half. The basic idea is to lay down sets that equal ONE, within a single suit/color. So the 1/4, 1/3, 1/12, and two 1/6 cards would work... assuming they are all blue. Each suit has a different graphic... the twelfth one is the easiest... an egg carton. The 1/2 card has a carton with 6 eggs in it. A 5/12 card would have an egg carton with 5 eggs in it, etc. The cards are cute... and definitely help the kids to be visualizing the fractions. The tenth suit is a one liter bottle, marked off in 10ths. The 16th suit is a ruler. All have adorable little bugs on them. Why is this easier than Rummy? Well... you only have one goal -- making ones. None of the decisions about whether to use the 10 of hearts in a 3 of a kind, or whether to use it to make a run of of 8, 9, 10 of hearts... all you are focusing on is making it total 1. Here's my kids playing. What has been really interesting about this is that William (the one in the blue flannel) has done really well at this... usually beating his big brother. 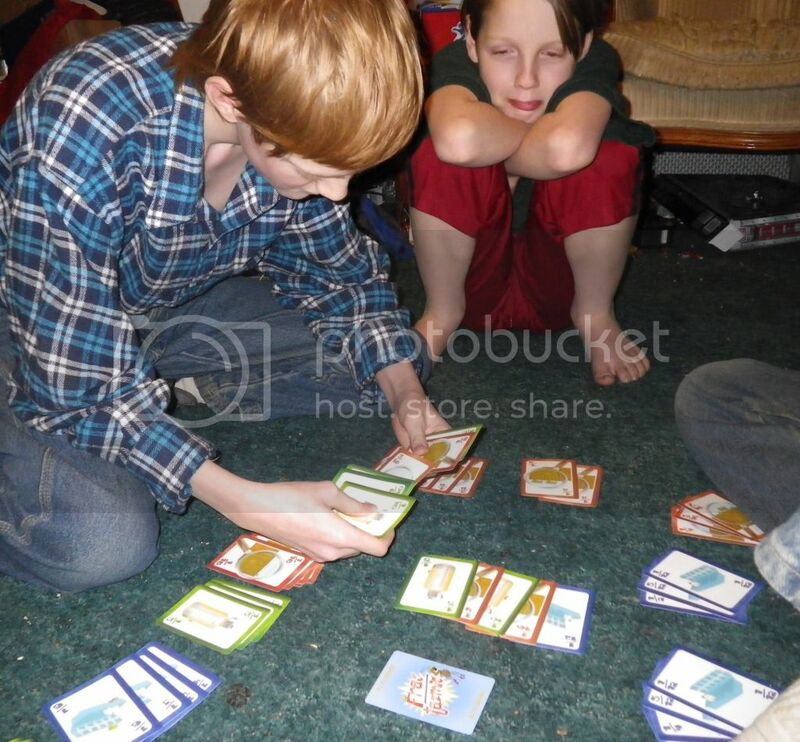 Thomas (the one moping) took a few games before some things "clicked" for him in figuring out strategy. 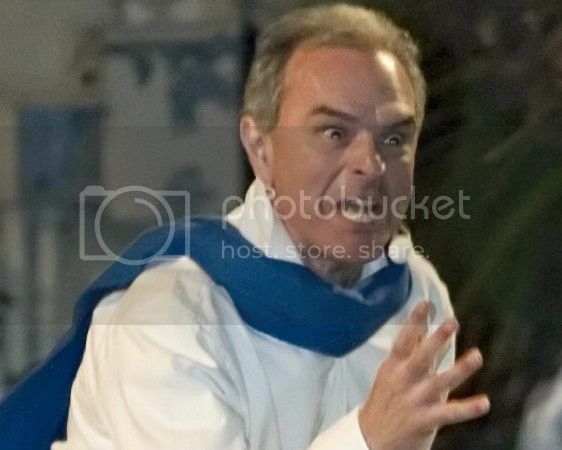 This photo was taken while he was still in that pre-click stage... you know, the "this is awful, I hate it, my brothers always beat me, I hate this" phase. Since having that a-ha moment though, he is actually finding the game fun. In fact, he won the game the four of us played. There is another version of the game too: Trap. 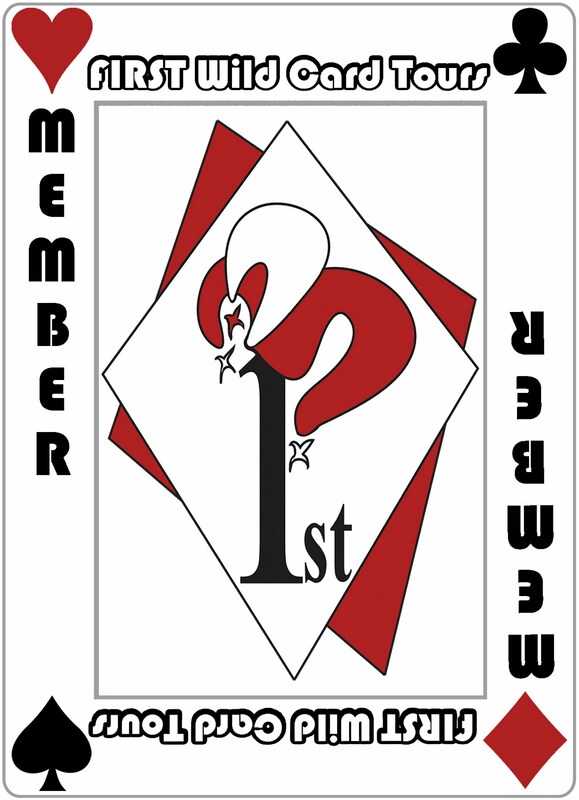 In this one, the first player lays down a card, and each player then has to lay down another card in the same suit. The goal is to either make 1, or force the player after you to go over 1. Trap is easier to play, because you can coach younger kids along as you go. "Okay, so if we add this up, we have 13/16... what would we need to get to one?" The coaching doesn't really take away from the fun of playing the game, and it gives a chance to model the fraction conversions. I adore this set of cards. I really want to be able to purchase the other two math games that I See Cards carries... Pyramath (which was reviewed by the Crew last year, but I wasn't on it) and Prime Bomb. At $6.95 each, the price is reasonable. And this game is FUN (and educational too). I wish I could purchase both now, as they'd make fabulous stocking stuffers. I will be getting them in 2012 though. Sometime. How is your Christmas season going? Are the commercial aspects becoming too important, in spite of your vows to focus on the reason for the season? Today, I'm reviewing an inexpensive resource that is very easy to use, and it is focused on the birth of Christ. Grapevine Studies has three different "Birth of Jesus" studies available. I recieved a Beginner level intended for 5-7 year olds and a Multi-Level one, intended for ages 7 and up. I recieved these as e-books... and since I have two who fit the age range for the Beginner, and 4 who fit the Multi-Level (Richard, 7, could do either... so those numbers do NOT add up to equal the number of my living children!) I had to make some decisions. One was that in the craziness of the holidays, I really was not likely to keep up with both studies. So I had to choose. Sort of. You know me... I can't do anything as written. So I totally tweaked. My kids love these studies... 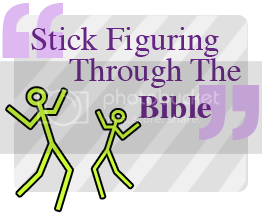 Stick figuring through the Bible, how much better does it get? The beginner level consists of seven lessons, intended to be done over two days each, plus a final review. The Multi-Level consists of a timeline intro (8 pages), four lessons intended to be done over four days each, and a final review. I ended up using the Multi-Level, but skipping the introductory timeline, going straight to the lessons. I think, after we complete the lessons, we are going to go back to the overview timeline. Maybe. For Trina, I will use the Beginner Level review (I may use that for Richard too), and I'm not expecting the same detail in some of the lessons. The first day is a review of the timeline, so we spend time talking about Mary & Gabriel, and about Mary & Elizabeth, and we go over the memory verse, Luke 1:31. This lesson does not take long at all. Lesson page 1 consists of four separate scenes, all involving Joseph... hearing the news, making a decision to divorce Mary quietly, Gabriel visiting, and Joseph's new decision. This lesson also includes reading Matthew 1:18-24. And there are five words to look up in a Bible dictionary. I *love* that we are getting into some real Bible resources. There are things to discuss. Lesson page 2 consists of three scenes, from the census decree to the birth of Jesus in Bethlehem. You read aloud Luke 2:1-7 and Matthew 1:25. There is a mapping assignment on this day, and you work on memorizing Luke 2:7. Plus discussion for each of the scenes, and some review questions. Student Drawing Page is where the student chooses their favorite part of the lesson to draw again, and you work more on the memory work. This day is also usually pretty short. Two scenes, that of Joseph hearing the news and making a decision to divorce Mary. You read Matthew 1:18-19, have discussions about these, and look up two words in a Bible dictionary. You start memorizing Matthew 1:24. Two more scenes, with the angel visiting Joseph and Joseph & Mary together, including discussion, and the reading of Matthew 1:20-24. The Beginner Level does not include mapping assignments. If I were to start this week... I think I would consider one of two things. Either do the Multi-Level starting with the lessons, doing each lesson over two days, to complete two this week and two next week... and I'd spend the week after Christmas doing the final review. Or, I'd go ahead and start with Lesson 1 tomorrow... doing a day each day, five days a week... which would get you through the shepherds going out and proclaiming Jesus' birth. Then I'd follow up with all the "after" stuff (visiting the temple, the wise men, etc.) after Christmas. In other words... it isn't too late. And this study is really inexpensive. Get the e-book version so you can have it almost immediately, and so you can print out copies of the student pages for each of your students. Right now the teacher book and student book are on sale, and would cost just under $11. There is also a Level 5 set available... meant for teens and adults. I adore the Level 5 studies I've used, so if your children are older, this one would be my recommendation. Sight unseen, I know I can say that! What I love most about these studies is that other than being sure to have my Bible, a Bible dictionary, and some colored pencils handy, I really don't have to do any prep work. Or maybe I most love that my kids think it is fun and they really remember what we have stick-figured. Check it out. And Merry Christmas! Disclaimer: I did receive the products as mentioned above for the purpose of a review. All opinions are my own. For more about my take on reviews, visit my blog post here. I have dearly missed doing Bountiful Baskets. Colorado is an "A week" state... so all the locations are only every other week... and unfortunately, when Bountiful Baskets took the Saturday after Thanksgiving off, that was an A week. So it has been 4 weeks. And it will be 4 more, as Christmas Eve is an A week also. one bunch of asparagus. Yummm. Connor chose another one of these as his 'extra' for volunteering, so we actually ended up with two. four tomatoes. Which we really needed. a ginormous butternut squash. Even more Yummmmm. I chose another (a normal sized one) for my extra. one bunch of romaine lettuce. two green peppers. Something else we really needed. two avocados. I'm the only one in the family who appreciates those. six Fuji apples. We were actually out of apples, so this is quite appreciated. six pears. We love pears. twelve clementines. Those itty bitty orange-like things. These are yummy too. one pineapple. Yum, yum, yum. Thomas chose a second one as his extra. nine bananas. Those are always appreciated. a big bag of red grapes. William chose a second one for his extra. And we got a huge box of oranges. Plans are pretty boring here. We'll eat the fruit. I may dehydrate some of the pineapple. Tomatoes, green peppers and lettuce will simply be used without any planning necessary on my part. The avocados? They aren't ripe yet... by the time they are, the guacamole in my fridge will probably be gone, so I'll make some more. I ought to come up with something else to do with one. I don't know though. Asparagus will be served with dinner a couple times this week. And Butternut Squash keeps, so that will be served with dinner probably three times later this month. The best part was finishing up and heading back to the van to watch the eclipse. And we didn't have to get up special to see it! We've been clients and not just volunteers at a mission in town the past month or so... and today that meant lots and lots of oranges... 21 of them. And a couple of grapefruit. Some other produce too, but none of that overlapped with my Bountiful Basket. I'll probably be juicing the mission oranges... unless I come up with something else I can do with them. Like maybe I'll do some canning... I've never canned citrus before... but Pick Your Own has some pretty easy-sounding directions. It's time for another Reading Aloud Challenge... and not an entirely bad week. Though I can't seem to actually finish anything. Connor & I are, yes, still nearly through Peace Child. It's a good thing this one isn't actually tied to his history studies. Because according to the Sonlight Instructor's Guide, he was supposed to finish this about five weeks ago. Good thing he is doing great on the rest of the books involved. I think we're going to plan for about 1/4 of the books (which are *intended* for him to read himself) to be read-alouds... and I'm not going to feel terribly committed to the schedule. We will finish this week. I think we're down to the last five or so chapters. William and Thomas are still doing (barely) God King. I got distracted. We're still going through D'Aulaires' Book of Greek Myths. 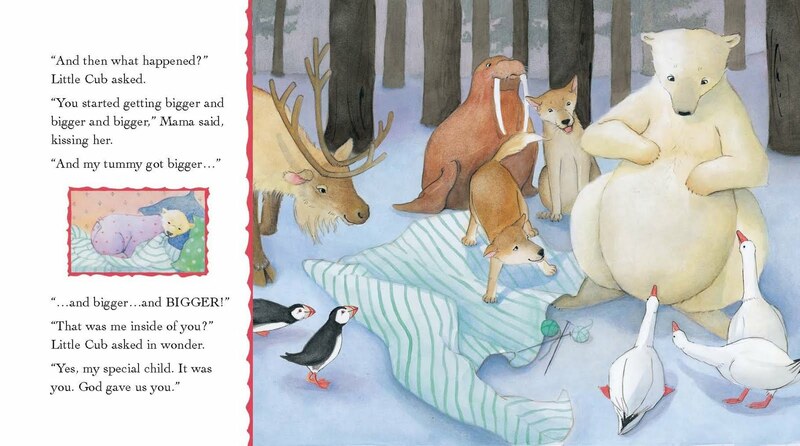 I still love this book. 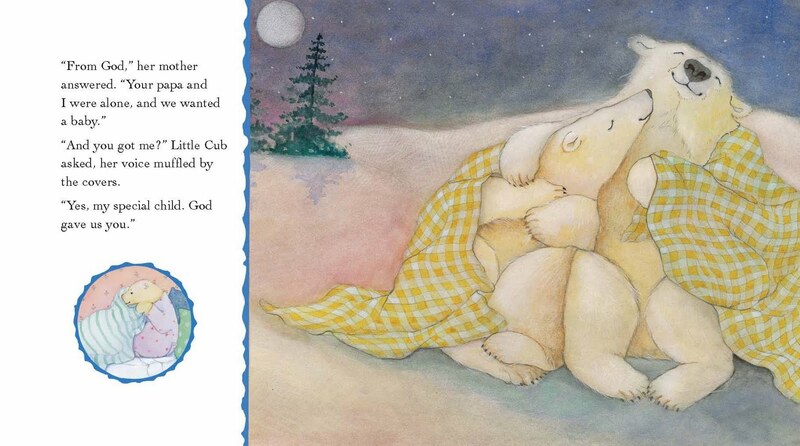 The illustrations are gorgeous and this is just a fantastic telling of these stories. And everyone is still working on a review book, Unveiling the Kings of Israel. We're on track to be reviewing it next week. If life wasn't so crazy this week, I've done enough to post it now. Richard and Trina are listening to Mountain Born. They are loving it, and I'm remembering why I love it. 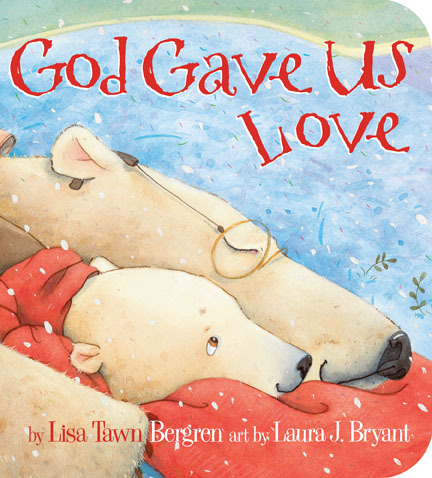 And we started a Christmas read-aloud. The Story of the Other Wise Man by Henry Van Dyke. Never read it before. And we aren't far enough into it that I'm actually recommending it. The language used is great though... it was written a long, long time ago and you can tell that. Ask me next week, when we're through more of it. How did your week go? 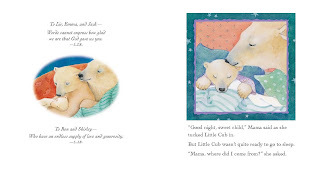 Are you reading something for a Christmas read-aloud? Sign the linky to link up your reading aloud post and I'll come visit your post and I will figure out how to comment. Okay, so I've always like the Life Application Bibles that I have seen, but I've never been able to afford to get one for myself. One random person each day will win a Life Application Study Bible Family Pack (Guys Life Application Study Bible hc, Girls Life Application Study Bible hc, Student's Life Application Study Bible hc, Life Application Study Bible hc, Life Application Study Bible Large Print hc). One Random person each week will win an Apple iPad 2! Everyone that signs up gets a free download copy of the Life Application Bible Study – Book of Luke! I would love to win... Trina would get the Girls one (eventually), Thomas would probably get the Boys one, William the Student's one, Connor the regular one, and ancient me could have the Large Print one. Wouldn't that be simply amazing? Disclaimer: Posting this gives me an extra chance of obtaining some Bibles... but no other compensation was received. I just think this is a fabulous giveaway. I have the feeling that I'm going to be sounding like a broken record here... but I am thrilled, thrilled, thrilled to have had the opportunity to review a totally amazing product. Pitsco (no, I hadn't heard of them either) makes incredibly cool stuff. We got to review their Medieval Machines Pack. I mean, really... anything with a name like that is going to score points in my testosterone-filled house, you know? 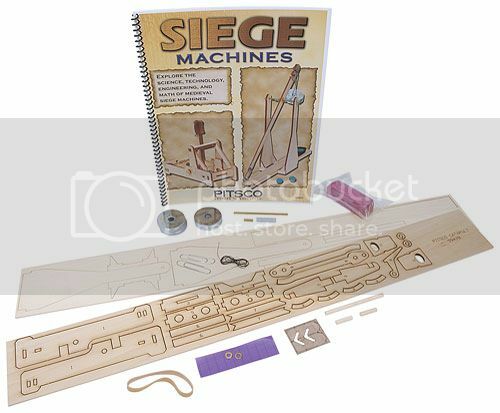 It is intended for roughly ages 10 and up... though with most children closer to 10, you'd definitely need to plan on providing some assistance with the assembly and also with the math aspects of the Siege Machines book. Pitsco also threw in some extra clay, as that is the only approved projectile for these kits. My boys laughed... and started plotting a way to make a bigger one that they can use to fling their sister away. But I digress. 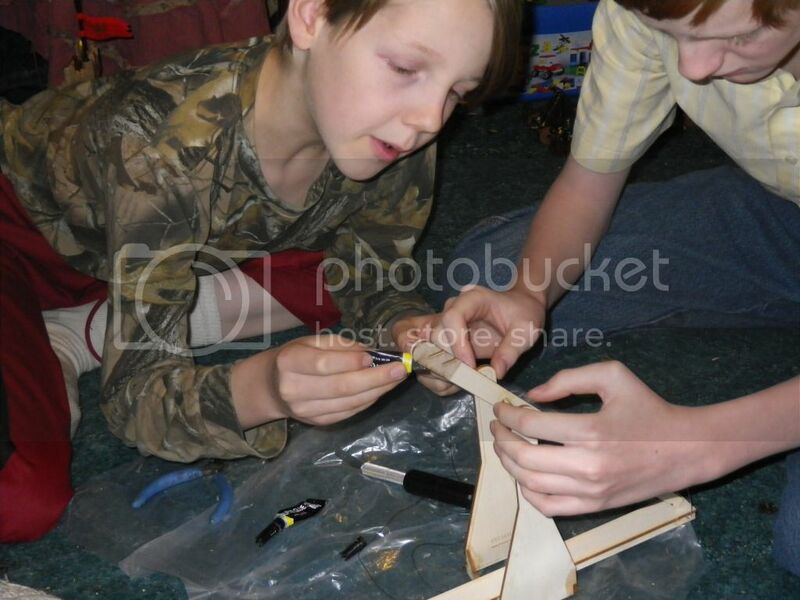 Since Thomas had a birthday coming up, and since he wanted to work on earning his Engineer Activity Badge for Webelos, and since one of the requirements for that is to build a catapult... well... yes, this was a birthday present for my newly 11 year old son. Basically, assembly required the kit and a couple things we had around the house... super glue, we used waxed paper as a surface, a toothpick... maybe a pencil or something in there. And Connor was impressed by the thoroughness of the directions. "I'm really liking the instructions. They do give you a pretty good idea as to what is coming up so that you don't put glue into a place where it will mess you up later." After a couple of days with that, it was time to build the trebuchet. Only that called for a hobby knife, and while we think we own one, we couldn't locate it. Fortunately, they are a recently discontinued item at Airgas... so Dale brought home the last two they had at the store. Employee price on those was about a buck each. I love when life works out that way! The kids DID stick to clay with the trebuchet. So far. Experimenting with how much weight is needed to make the trebuchet work with various sized clay balls occupied a fair amount of their time. And they discovered that if they use the trebuchet to launch a clay projectile at William's birthday present (a MegaBlock King Arthur castle) it will smash the chain holding up the drawbridge, or whatever it was. 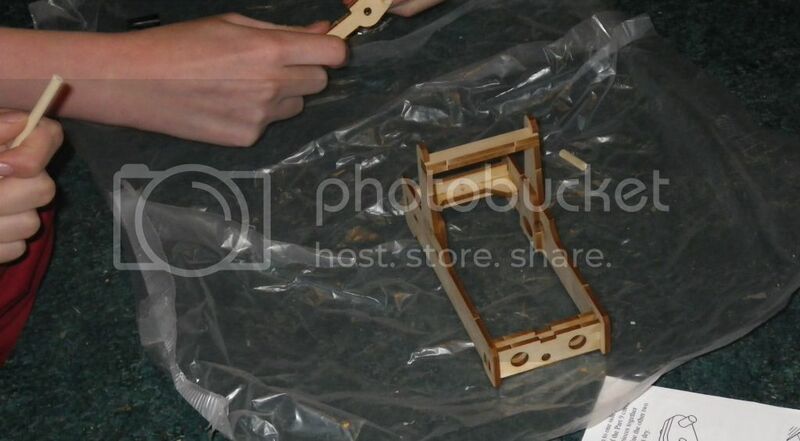 The catapult, however, didn't inflict any actual damage. To be quite honest, this set would have been well worth the $21.95 price tag just for the two kits and the weights. 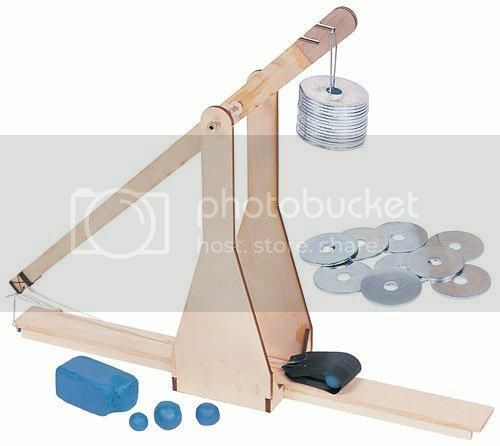 We have built catapults here before. They usually cost us roughly $7-10 for a kit, and they generally handle a couple hours of use before they start to fall apart. 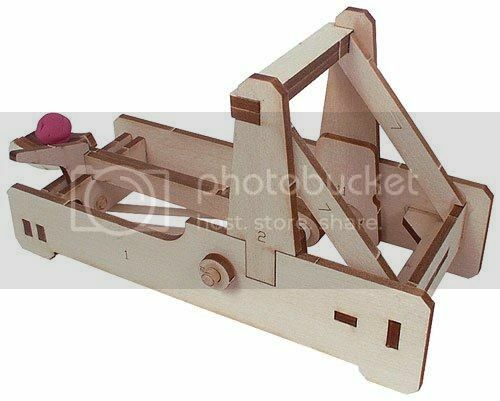 I've never seen a trebuchet kit before, though we have casually looked. Anyway...this catapult has withstood a lot of use already, and it is still solid. The trebuchet seems a bit less sturdy, but the kids figured that out too and are a bit more careful with it. To sound like an infomercial here... but wait! There's more! Remember I mentioned a book. Oh. My. This book is fabulous. It's a skinny little thing, but don't let that fool you. The book starts with four pages of history... we learned about Dionysius I, Philip of Macedonia, Alexander the Great, the Romans, the Chinese, the Crusades, Medieval castle sieges, the resurgence of siege weapons in museums and classrooms, catapults used in WWII, and the Punkin Chunkin Contest. 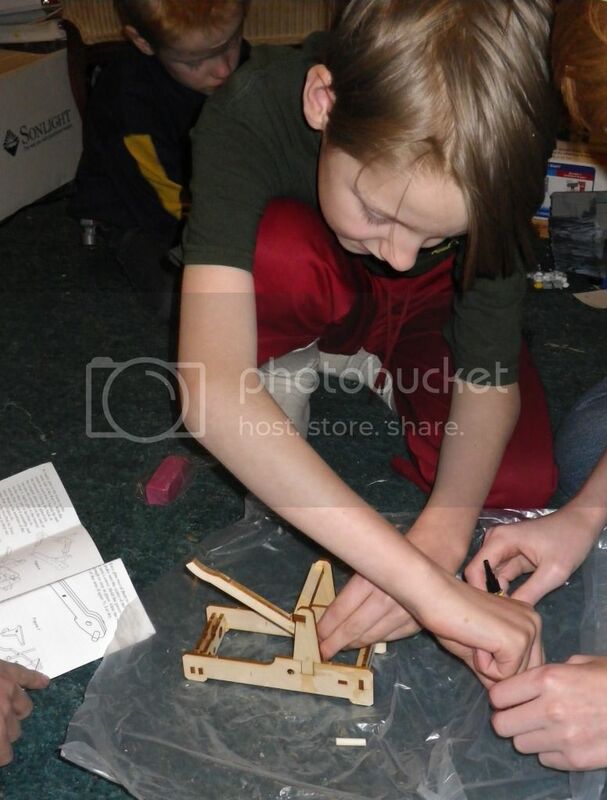 As if that wasn't enough to make this mama's heart go pitter-patter, there are nearly a dozen activities that you can do with the catapult or trebuchet. And by "activity" I mean interesting scientific explanations, serious science experiments or real math work. Wow. Just wow. We aren't very far with this. Yet. But let me go through a bit of it so you have a clue as to what I'm talking about. The first activity is dealing with tension and torsion. There is a full page, with a couple of illustrations, explaining the two forces at work in a catapult. Fascinating stuff. And having built and played with the catapult, this made total sense to the three older guys (11, 13 and 14) and even the 7 year old. So this first one is essentially all information. The third activity is a math one. It has them working with converting the measurements from the experiment into metric (so inches to centimeters). Having worked with a group of junior high students in a science class last year... anything that is giving kids some real data to practice conversions is a good thing. In addition to the activities actually mapped out in this book, there are a whole bunch of extension activities or additional variables... so you can do far more than just the listed activities. 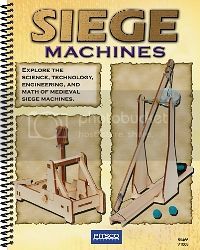 And if that isn't enough... they also have a Trebuchets Teacher's Guide and a Catapults Teacher's Guide available. These look pretty amazing too. In addition, they have a lot of other incredible looking projects and kits. I've been staring at the Bridge Engineering Pack (something else we could use for that Engineer badge) and the Solar Water Heater Pack. I think these are a fabulous value. 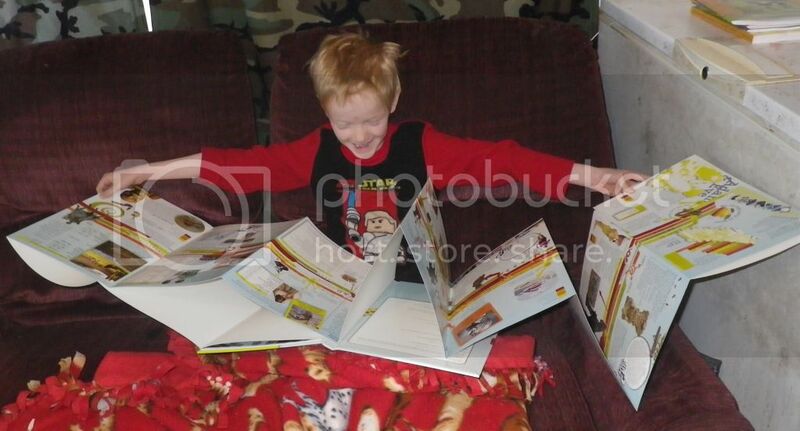 Disclaimer: As part of the TOS Homeschool Review Crew, I did receive the products mentioned for the purpose of a review. All opinions are my own. For more about my take on reviews, visit my blog post here. Wow. Just wow. I want to purchase a case of these and hand them out to a lot of the young people in my life... and to suggest that their parents read it too. In the mythical city of N’de lives thirteen-year-old Hadlay and her people, the Ramash. Scorned and abused by the unloving and absent Emperor, the Ramash are poor people, placed second to the ruling class of the Oresed. Young but bold, Hadlay rages against the injustice in her city. When she is chosen for the honor of serving the Prince in the Tower, she hopes to find a way to right the wrong... but soon discovers that things are worse than she believed. While Hadlay works to better her people’s condition, she struggles to abide with the abusive Oresed and understand the meaning of her dreams in which a fantastical white horse appears to her and speaks in riddles. 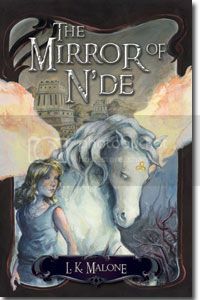 When Hadlay stumbles into one of the Tower’s secret rooms, she discovers a hidden mirror that doesn’t just show her reflection, but reveals much more: the horse’s name is Sirach and he has a plan to save the children of N’de, if only Hadlay can bring them to the mirror. Hiding her knowledge of Sirach from the Prince, Hadlay sets out to do Sirach’s bidding. But when Sirach’s presence is revealed, Hadley’s life is in danger and the only way to save her is for Sirach to give up his own. 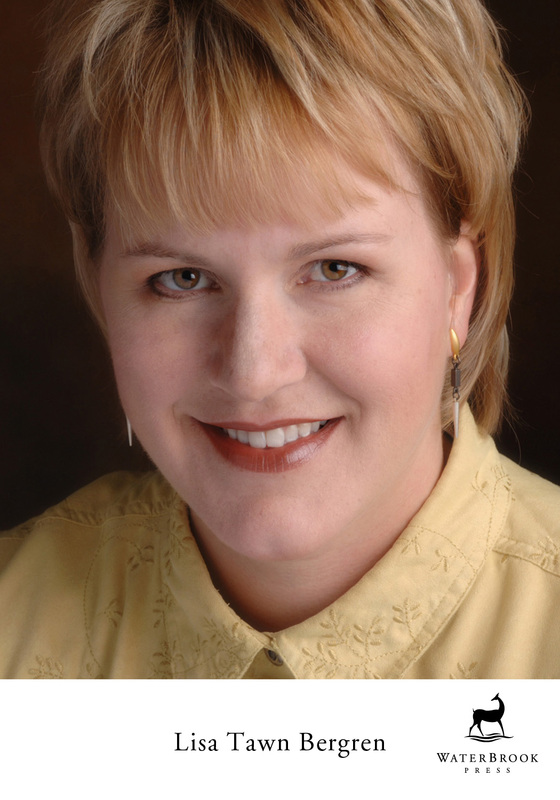 Crafting powerful narrative and creative characters, author L. K. Malone spins a compelling tale that combines exciting entertainment and the Christian story. In The Mirror of N’de, readers will empathize with the desires of an oppressed people, will anger at the affliction of a cruel adversary, and ultimately rejoice with the revelation of a Savior. And on another level, it is a standard coming-of-age story. Most of the characters are in their 13th year, but the complexity of the plot makes this a novel that would appeal to kids and adults. I will be handing this to my kids. The publisher is sponsoring a $50 Amazon.com giveaway. I know I can always find something to buy at Amazon! To enter all you have to do is send a tweet (using @litfuse) about The Mirror of N'de or share about it on Facebook! If you tweet we'll capture your entry when you use @litfuse. If you share it on Facebook or your blog, just email us and let us know (ckrumm@litfusegroup.com). Easy. Disclaimer: I received this book through LitFuse, and by blogging about it I earned one entry in the above mentioned giveaway. No other compensation was received. All opinions expressed in this review are my own. As we come up on the seventieth anniversary of "a date which will live in infamy" I find myself thinking about the changes brought about by that fateful attack on Pearl Harbor. So when I heard about the book December 1941 by Craig Shirley, I knew it was something I would want to read. I was able to obtain a ePub copy to read on my Nook. I think it was a good way to go, as this book is HUGE. The hardcover would have overwhelmed me. On my Nook, it is 741 pages, with the last 150ish pages being notes. Since this book traces the events of the month day by day, that is an average of 19 Nook pages per day. December 1941 traces, day-by-day, the most important 31 days in the history of America’s participation in WWII, which snuffed out the lives of millions and changed history forever. From December 1, 1941, until the morning of December 7, 1941, America was at peace and—with the exception of the stubborn and persistent high unemployment of the Great Depression—was a relatively happy country. By the afternoon of the December 7 attack on Pearl Harbor, America was a radically changed country, forever. Its isolationist impulses evaporated, and both major political parties became more or less internationalist. The month also introduced food and gas rationing, Victory Gardens, scrap drives, a military draft, and the conversion of Detroit into an "arsenal of democracy." From the moment of America’s entry into World War II, people of all kinds, but mostly women looking for work, flooded into the city. Instant apartment buildings sprang up, as did eating and drinking salons, all to the advantage of the massive increase in spending generated by the federal government. December 1941 is a fascinating and meticulously researched look at the American home front—her people, faith, economy, government, and culture. The book is great. Craig Shirley pulls information from so many different sources and it is fascinating to read what was in little newspapers (and big ones) on the days before Pearl Harbor especially. That is not something I've ever seen before. Of course, the reports from during and just after the Pearl Harbor attack are fascinating as well, and I was a little surprised at how much else happened in that single month. I was a little worried when I understood that this book was pulling so much from newspapers and other original sources, but it is woven together incredibly well. While I can't sit and read this for hours at a time (mostly because there is just so much information) this is totally worth the time. Disclaimer: As a Booksneeze Blogger, I did receive this ebook for free from Thomas Nelson. No other compensation was received. For more about my take on reviews, visit my blog post here. Today I have the chance to talk about a cute book for kids... written and illustrated by a mom/daughter team where the daughter is about the age of a couple of my boys. 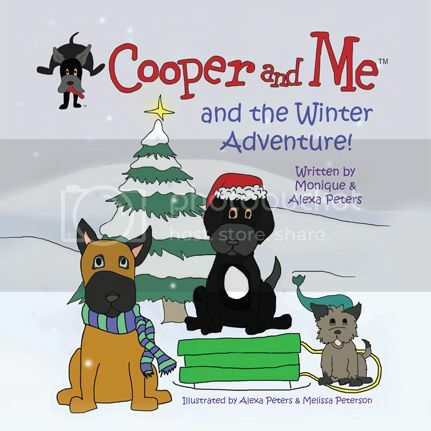 Cooper and Bella can't wait to go sledding, but what happens when they wander a little too far from home and a snowstorm makes it difficult to find their way back? 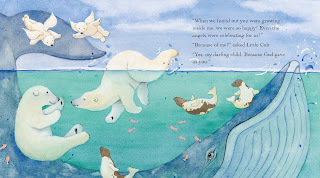 This book provides a wonderful opportunity to teach children the importance of making good decisions and the gentle lesson of how to be prepared in case they get lost. I got this title with my 7 year old, Richard, in mind. He is the one who I end up finding at the customer service desk at Walmart. He's not so bad outdoors, but in general, if a child is going to wander off and end up who-knows-where, it is this one. The big thing I found in this is that it is a non-threatening way to reinforce the message about what to do when you are lost. Since it is a couple of dogs who get lost, not little kids, it is so much easier to talk about what they did right and what "you" should do. This book is cute and inviting. The illustrations are sweet, as you can see from the cover photo above, which is pretty typical of what you find inside. And... $1 of every Winter Adventure book sold will go to advance research & treatment of pancreatic cancer, via the Lustgarten Foundation. Also, the great folks at Cooper and Me are offering a special deal for my blog readers now through December 15. Make any purchase of $25 or more at CooperandMe.com and get FREE SHIPPING by using the code COOPERBLOG at checkout. I also have the chance to give one away. This giveaway will end next weekend, so the book can be shipped out early next week... and it ought to arrive with plenty of time for Christmas! This would be a great thing to slip into a stocking or put under the tree. It's time for another Reading Aloud Challenge... and I have to apologize for taking an unscheduled week off for Thanksgiving. I planned to post on Turkey Day... but I woke up with a migraine, and ended up deciding that it could just wait until this week. We took last week off school anyway, since Dale had vacation time he had to use. Connor & I are nearly through Peace Child. It's a good thing this one isn't actually tied to his history studies. Because according to the Sonlight Instructor's Guide, he was supposed to finish this about a month ago. Good thing he is doing great on the rest of the books involved. I think we're going to plan for about 1/4 of the books (which are *intended* for him to read himself) to be read-alouds... and I'm not going to feel terribly committed to the schedule. I finished Hittite Warrior with William and Thomas. Great book. We started (barely) God King. Can't say anything about that one yet. And everyone started seriously working on a review book I haven't talked about, I don't think. 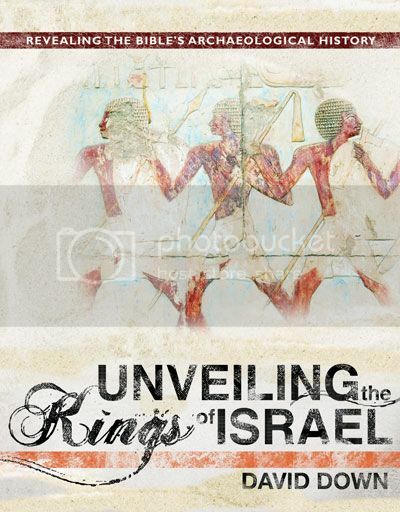 Unveiling the Kings of Israel. We started it awhile back, but life got crazy and we weren't doing more than a section at a time. Picked it back up last week, and we are hopefully going to finish it up sometime next week. Richard and Trina are listening to Mountain Born. They are loving it, though we haven't gotten far. Plans for this coming week? Finish Peace Child with Connor. (I don't want to type that again!) Work on the rest of the above stuff. 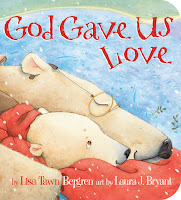 And hopefully get started on a Christmas read-aloud as well. A fort. A giant fort. An American-made giant fort. Is that the coolest thing? Toydle is located in Idaho... and each wood block is hand-crafted by a real person. And they are gorgeous. The forts have an unconditional lifetime guarantee. We just went through Cyber Monday, and whatever it was they were calling the Saturday (with the emphasis on supporting small businesses)... so this is an opportunity to do both... buy a fort online, and support a small business too. Disclaimer: As part of the TOS Homeschool Review Crew, I did receive a fort in exchange for posting about this giveaway and blogging a review. This post fulfills part of that obligation. The review is coming in the beginning of January. All opinions are my own. For more about my take on reviews, visit my blog post here.